Melanoma is a serious problem that impacts many people all over the world each year. Commonly defined as a new or unusual growth on the skin, or a major change in a mole, melanoma requires professional treatment from a doctor. If you have melanoma, there are no at home treatments that can make it go away. However, there are a variety of treatments that may be effective, depending on the type of melanoma and the particular stage you’re in. 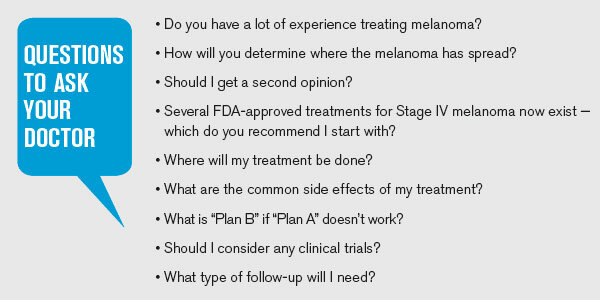 Use this guide to inform yourself and learn more about your treatment options when dealing with melanoma. It can be serious, but it doesn’t have to be life-threatening if you can catch it early. Melanoma can be a big problem for people of all ages, and while sun exposure is a common cause, it is not always the reason you’ll end up with this problem. In some cases, like subungual melanoma, the sun might not really have anything to do with it at all. The good news is that there are a variety of different treatment options once you spot an atypical mole or other complications related to melanoma. As with most medical conditions, seeking treatment early gives you the best chance when it comes to recovering fully without issue. If you see any symptoms that could be melanoma-related, reach out to your doctor for an appointment right away. It’s always better to be safe than sorry with a serious issue like melanoma. Subungual melanoma is a type of melanoma that impacts the nails on your hands and feet. In fact, this type of melanoma actually impacts your body deep within the hands at a place called the nail matrix, which is below the hard part of your fingernail that you feel. While typically people experience this type of melanoma on the fingernails, treatment is generally the same for both hands and feet. A subungual melanoma will often look like a bruise, which can lead people to ignore this somewhat serious problem. Going to the doctor is important for proper treatment of what can be a very serious condition if left unchecked. 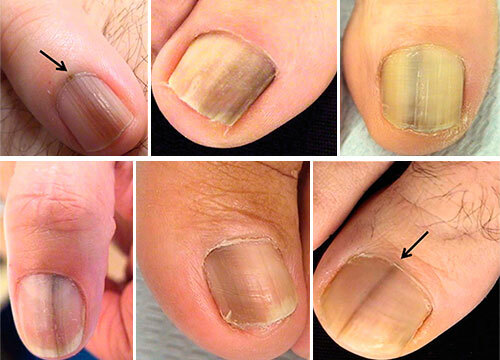 Dark-brown or light-brown colored band on the nail. This band usually appears vertical in orientation. Brittle nails or cracking nails. Dark nail pigment that extends to the skin areas on the hand near the nail. More information about symptoms of subungual melanoma you can read here. Surgical removal of the nail. During this treatment, the doctor will completely remove the nail to continue the procedure. Removal of the growth beneath the nail. The subungual melanoma is in the nail matrix, so removing the nail only allows access to the growth. Ocular melanoma is a type of melanoma that impacts the eye. Commonly referred to as eye cancer, this is one of the more difficult issues to treat. Flashing specks of light or dust in your field of vision. These may occur regularly or just once in a while. Dark spot on the iris. This may grow over time. A change in pupil shape. This often makes the eye look darker and is one of the more obvious signs of this type of melanoma. A loss of peripheral vision in one or both eyes. Poor or blurry vision in one or both eyes. While ocular melanoma can be hard for even experienced doctors to deal with, the good news is that there are a variety of different treatment options that may be effective. Waiting and watching. Small melanomas may not require immediate treatment since the impact of a surgical option can damage the eye and cause poor vision. Plaque radiation therapy to help kill the problem cells. Gamma knife therapy. Another type of radiation therapy, this can be effective in dealing with more serious forms of ocular melanoma. Surgical removal. This can lead to eye issues down the road, but in some cases, it is required anyway. Discuss these different treatment options with your doctor if you have signs of melanoma in the eyes. Your doctor will likely be able to advise you on the best course of action. Nodular melanoma, at least in most cases, is treated through the removal of a mole, though lymph node treatment may be needed too. While many people want to know how to get rid of a mole, a nodular melanoma is not something you can deal with on your own even though it may look like a normal mole. Surgical removal. Nodular melanomas may also require lymph node surgery if the melanoma has spread that far. Chemotherapy. Chemo in the form of injections or a pill is sometimes prescribed for dealing with a dangerous form of nodular melanoma. Radiation therapy. X-ray technology is used to help kill the cells that are creating the nodular melanoma. This is often the most severe form of therapy, but it is necessary in complex cases that are life-threatening or could become life threating if left untreated. 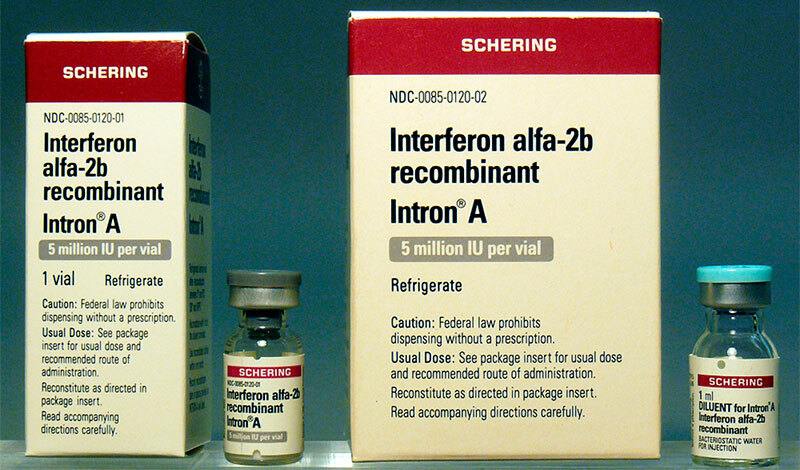 Interferon is a type of drug that is commonly used to help cancer patients and people dealing with cancerous growths like melanoma. However, this type of treatment is not typically used on its own. Instead, interferon is usually used after an initial course of treatment that’s more powerful and focused for the type of melanoma being treated. Interferon treatment can cause short-term side effects. Talk to your doctor if you experience nausea, vomiting, fever, diarrhea or severe weakness. In most cases, interferon treatment is done after the initial melanoma has been removed and doctors are looking to prevent relapse. While interferon treatment does have some potential drawbacks, it’s a much more natural, safe treatment than most initial options like radiation, chemotherapy or surgery. If you’ve had a melanoma and are now in remission, your doctor may recommend interferon treatment to help you avoid developing an atypical mole or other problematic growth again. In rare cases, interferon may be used with radiation therapy. This is most common during stage four cancer when more needs to be done in an attempt to help the patient recover. Detecting a melanoma through something simple like a painful mole can be difficult for medical professionals. That’s why treatment guidelines have been put in place for determining if moles and similar growths may be dangerous to the patient. While doctors can deviate from these guidelines if signs of melanoma are obvious, understanding the basic procedures can help you as a patient. When you visit your doctor with concerns about melanoma, they will likely go through these steps to diagnose your issue. Biopsy. Taking a small sample of the potentially problematic tissue will help your doctor determine if you have a melanoma and how to proceed. Blood workup. A blood workup may be done to detect any form of cancer, as well as the severity of the issue at hand. Diagnosis. A diagnosis allows your doctor to discuss treatment options with you. In some cases, your doctor may choose to simply watch the melanoma over time without taking immediate action. This will become part of your treatment plan. Surgical intervention or other treatment. This could include removing a growth or a process like chemotherapy, gamma knife therapy or radiation treatment. Follow-up and preventative care. Once the melanoma has been treated, your doctor will want to follow up with you regularly to ensure that you’re in good health. Preventative options like interferon treatment may be recommended. Catching melanoma early is essential to recovery. How serious your cancer is will also determine the course of action that your doctor will take. In many cases, this will depend on the particular stage your cancer has reached at the time of diagnosis. 99% of melanoma patients survive with early diagnosis. Stage 0. Surgical intervention, sometimes called wide excision, is typically recommended for this form of melanoma. 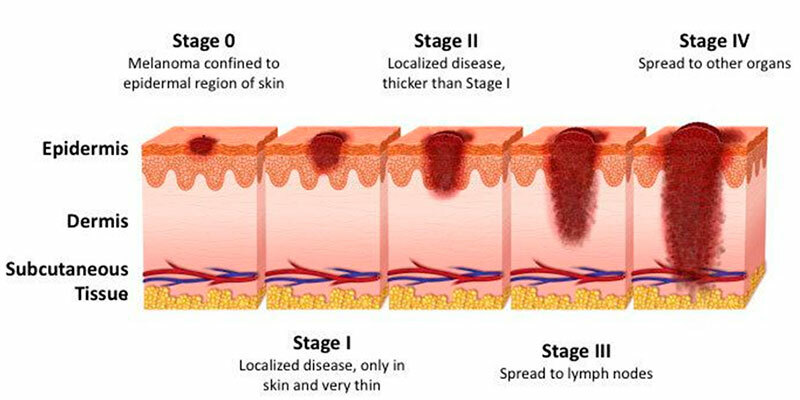 At this stage, cancer has not gone below the top layer of skin, so treatment is less invasive. Stage 1. Surgical treatment is still most common during this stage of cancer. A lymph node biopsy may be performed as well to see if cancer has spread deeper into the body. Stage 2. Surgical treatment is common, but more skin will need to be removed, as cancer has spread deeper into the body. A lymph node biopsy is likely during this stage. Stage 3. Cancer has reached the lymph nodes by stage three. Surgical treatment along with other forms of treatment like radiation therapy or chemotherapy are common. Immunotherapy treatment may be an option for some forms of melanoma. Stage 4. Chemotherapy or targeted radiation treatment is common during the difficult stage four. Metastases in internal organs are often removed. Immunotherapy options are sometimes used along with chemotherapy or targeted radiation treatment. Metastatic melanoma, commonly referred to as malignant melanoma, is a very serious condition. When this occurs, more treatment is often needed, and the treatment options may be more severe. A combination of targeted radiation treatment chemotherapy. These may not be performed together, but staggered to help achieve the best possible treatment for your specific melanoma diagnosis. Oral antiviral drugs to help slow growth of cancer. Metastatic melanoma is a very serious condition that requires active treatment from a doctor. If you’re dealing with this type of melanoma, following your doctor’s instructions is your best chance of beating cancer and going on to live a longer life. 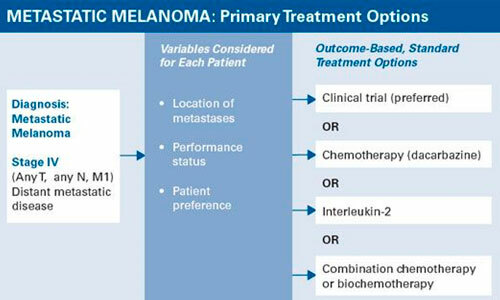 Melanoma, depending on the type you’re dealing with, has a wide variety of different treatment options. In this case, the best option you have is to seek the help of a doctor who understands melanoma and can help you find the best treatment. Melanoma is not something you can diagnose and treat on your own. Following your doctor’s instructions, as well as going back for regular checkups as requested, is essential even with mild forms of melanoma. If you don’t do this, melanoma can get worse and spread, causing the need for more severe treatment like radiation therapy or chemotherapy down the road. Check yourself regularly for signs of melanoma as you age, and make sure you schedule regular visits with your doctor. Catching melanoma early is your best bet to avoid difficult treatment procedures and live melanoma-free for as long as possible.